There was much good to be found in President Donald Trump’s speech on Sunday to the Muslim-majority heads of state gathered in Riyadh, Saudi Arabia. You can read the speech in its entirety through this link and it is well worth the time. …in sheer numbers, the deadliest toll has been exacted on the innocent people of Arab, Muslim and Middle Eastern nations. They have borne the brunt of the killings and the worst of the destruction in this wave of fanatical violence. …the nations of the Middle East cannot wait for American power to crush this enemy for them. The nations of the Middle East will have to decide what kind of future they want for themselves, for their countries, and for their children. In these three points President Trump was exactly correct, and he made them in a forceful and direct way that neither President George W. Bush nor Barack Obama could have or would have ever put it. We know you are behind, support, and fund Salafism and the ideology of cultural jihad preached in the Quran and we will no longer turn a blind eye to what you are doing. It is understandable that, from a diplomatic perspective, would not have advanced the policies President Trump is pushing to publicly reprimand the leaders of Muslim-majority countries, particularly the Saudi royal family, for their support for Salafism and cultural jihad. However, if the President’s senior intelligence and national security advisors and his National Security Council staff have convinced him that Muslim terrorism is the greatest threat to American constitutional liberty and the values of the Western Enlightenment then they have done a great disservice to their country and set the West on a course toward losing the war Islam has declared on us. Because terrorism isn’t the only, or even the most effective, weapon Islamists have deployed to undermine America and American values; the export of Sharia through cultural jihad and the doctrine of hijra – invasion through immigration – have been much more effective. And in that war, the Saudis are the original Islamic extremists. For more than two centuries, Wahhabism has been Saudi Arabia's dominant faith. It is an austere form of Islam that insists on a literal interpretation of the Koran. Strict Wahhabis believe that all those who don't practice their form of Islam are heathens and enemies. So, to be strictly accurate, Osama bin Laden, the Taliban and the Islamic State aren’t radical Islamic terrorists; they are Wahhabis or Salafists. Wahhabism's explosive growth began in the 1970s when, as NPR observed in a Frontline analysis, Saudi charities started funding Wahhabi schools (madrassas) and mosques from Islamabad to Culver City, California. The reach of the Saudis has been stunning, reported the New York Times, touching nearly every country with a Muslim population, from the Gothenburg Mosque in Sweden to the King Faisal Mosque in Chad, from the King Fahad Mosque in Los Angeles to the Seoul Central Mosque in South Korea. Support has come from the Saudi government; the royal family; Saudi charities; and Saudi-sponsored organizations including the World Muslim League, the World Assembly of Muslim Youth and the International Islamic Relief Organization, providing the hardware of impressive edifices and the software of preaching and teaching. The result of lavish spending on religious outreach for half a century, estimated in the tens of billions of dollars. The result has been amplified by guest workers, many from South Asia, who spend years in Saudi Arabia and bring Saudi ways home with them. In many countries, Wahhabist preaching has encouraged a harshly judgmental religion, contributing to majority support in some polls in Egypt, Pakistan and other countries for stoning for adultery and execution for anyone trying to leave Islam. In the realm of extremist Islam, the Saudis are “both the arsonists and the firefighters,” said William McCants, a Brookings Institution scholar. “They promote a very toxic form of Islam that draws sharp lines between a small number of true believers and everyone else, Muslim and non-Muslim,” he said, providing ideological fodder for violent jihadists. Yet at the same time, “they’re our partners in counterterrorism,” said Mr. McCants. 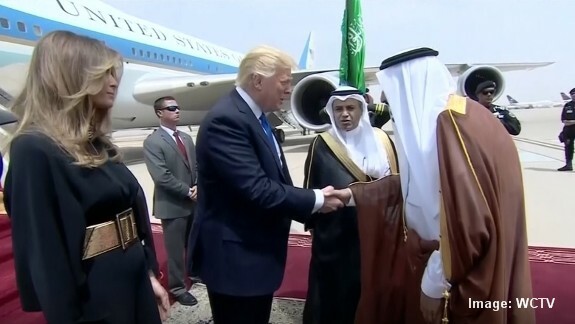 The President’s advisers, who want to convince Americans that the problem is “Radical Islamic Terrorism” and not the teachings of Islam and the doctrine of cultural jihad, will try to rebut this argument by saying the Saudi government has condemned what happened on September 11 and other terrorist acts and even now is funding the new Global Center for Combating Extremist Ideology that the President lauded in his remarks in Riyadh. The Saudis are now our partners in combatting terrorism as a matter of self-preservation, not because they have suddenly abandoned the Wahhabist teachings they have spent billions spreading around the globe. Yes, Prince Nayif [of Saudi Arabia] condemned bin Laden, and other princes... Prince Turki condemned bin Laden. They did not condemn that message. They condemned bin Laden. …Bin Laden learned this in Saudi Arabia. He didn't learn it in the moon. That message that Bin Laden received, it still is taught in Saudi Arabia. And if bin Laden dies, and this policy or curriculum stays, we will have other bin Ladens. Submitted by Tanaone on Mon, 05/22/2017 - 12:39. We have never been presented with a stickier wicket. How can we call the Saudis our friends when they are still promoting this message? And, I do not believe they are going to change their tune after spending billions world-wide in an effort to bring believers to Wahhabism. What happens if they are successful in defeating radical Islamist terrorism? Will they then resort back to their ideology of killing non-believers when they are no longer threatened by terrorism themselves? This leaves me in the uncomfortable position of wondering if that possibility is more plausible than any of us would like to think!! Submitted by email_registrat... on Mon, 05/22/2017 - 12:24.
where they are accepted and do not cause friction with the Christian and Jewish populations.